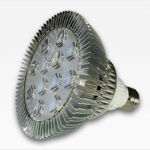 Efficient and optimized LED plant light that only requires 12 Watt to operate. With its low power cost and passively cooled aluminum housing this E27 light is a great option for any mid to large house plant in need of extra light. It is small but still versatile and can also be used to grow different kinds of kitchen herbs. This lamp is large enough to provide a decent amount of coverage for several smaller pots of herbs like basil, oregano, thymus and dill or even salad and can be used all year around for a continuous harvest of fresh greens without even making a dent on the electricity bill. This lamp has been produced with our spectrum, specifically optimized for different plant pigments. Besides red and blue light which mostly affect chlorophyll production it also contains green and near infra red light. Near infra red light (NIR) is used in conjunction with our different visible red wavelengths. When the NIR wavelengths are used together with visible red light, it helps the red light to penetrate further down into the cell structure of the plant having a greater effect on the plant compared to if there were only visible red light. Green light is used for production of Anthocyanin and some flavonoids as well as having a positive effect on cell development in leafs and stems. We use our selected green wavelengths in a ratio with red and blue that produces near white light. The mixture of wavelengths allow for all colors of the plant to be reflected which both looks nicer and is much easier on the eyes compared to regular grow lights only containing red and blue light. Its also important for any grower to be able to see all colors of the plant in order to identify any problems with it which becomes very hard to do if there is one part of the visible spectrum lacking.